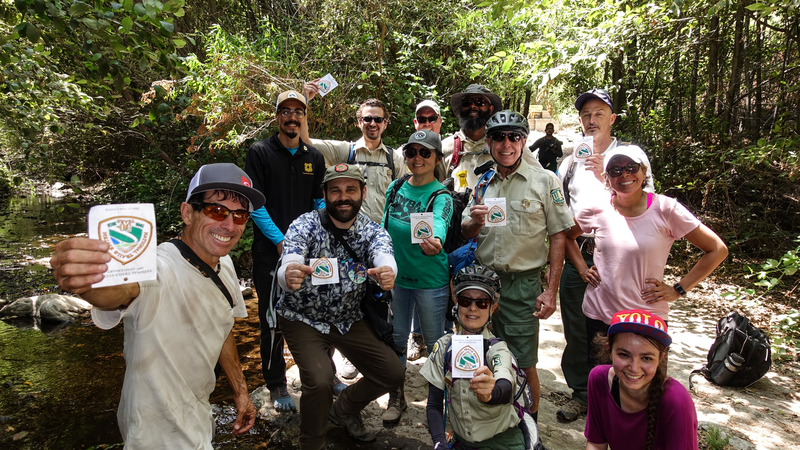 « Trail Users Celebrate: The Gabrielino National Recreation Trail is Back! Last week we finished the restoration of the Gabrielino National Recreation Trail in the Angeles National Forest, with help from MWBA, REI and Edison. But did you know the Gabrielino Trail we just restored was the very first National Recreation Trail in the Nation to be designated under the act? Those visionary legislators lacked the foresight to mention how many bicyclists it would also attract fifty years later! It would have been especially nice if their vision of the trail connecting to the proposed Pacific Crest Trail became a reality. During our hike with the Forest Supervisor and other members of the Forest Leadership Team to inspect our work on the Gabrielino last Friday, we were in an especially celebratory mood. We all given National Trails Act 50th Anniversary patches to commemorate the restoration project and the trail. The National Trails Act created three trail designations: National Recreation Trails, National Scenic Trails, and National Connecting and Side Trails. National Historic Trail designation was added in a 1978 amendment. NSTs are longer and more remote, usually over 200 miles, and include the PCT, the Appalachian, Continental Divide and Arizona trail, among others. Only a few of those are open to bicycles. There are only two designated National Side or Connecting trails, one between the Iditarod trail and Anvik, Alaska, and the Timms Hill Trail, connecting the Ice Age NST to Wisconsin’s highest peak. In the Santa Monica Mountains National Recreation Area, the 67 mile Backbone Trail was finally completed in May 2016 after a 40-year effort. CORBA also contributes to the maintenance of the Backbone NRT. It was designated a National Recreation Trail on National Trails Day in 2016, during the 100th Anniversary of the National Park Service. It was the newest NRT designation until the 2018 National Trails Day, when Secretary Zinke designated 19 new NRTs in 17 states. This entry was posted on Monday, August 27th, 2018 at 4:08 am and is filed under Rides and Events. You can follow any responses to this entry through the RSS 2.0 feed. You can leave a response, or trackback from your own site.